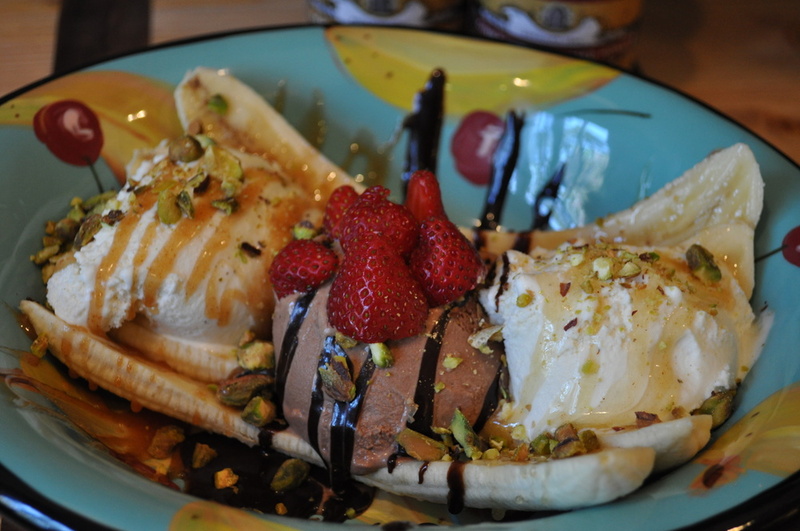 Go Bananas for The Savory Pantry's Gourmet Banana Split! Grab some big ole spoons and prepare to fight over the last few bites of this magnificent banana split! Lick My Spoon (this month's Featured Producer) will take you somewhere you haven't been before. Order or pick up your sauces from The Savory Pantry today. Since its 2013 launch when founder Kristine Insalaco-Gaioni was making just 4 jars of Caramel Sauce at a time, Lick My Spoon has earned five consecutive annual Good Food Awards. Using no artificial flavorings or preservatives, Insalaco-Gaioni develops award-winning sauces she dubs “American classics with Italian influences,” calling up her family’s Italian roots. Organic rosewater and spicy cardamom lend luscious flavor to Cardamom Rose Caramel Sauce, refreshing fruits add a touch of tart to Madagascar Vanilla beans in Mango Passion Fruit Caramel Sauce, and smoky Kentucky bourbon boozes up Bourbon Me Bourbon Caramel Sauce. It’s impossible to go wrong with the award-winning original Caramel Sauce and Totally Fudged Chocolate Fudge Sauce, both used in our banana split recipe. Use leftover caramel sauce as a salmon or pork glaze, or as a cheese accompaniment. Drizzle the caramel and fudge sauces warm atop yogurt, pancakes, waffles, or pound cakes. Peel and slice bananas in half lengthwise and place in bowl. Melt heaping tablespoons of caramel and fudge sauces in separate small bowls for 15-20 seconds in microwave. Set aside. Place pistachios in plastic baggie and crush by rolling repeatedly with the back of a large and sturdy spoon. Scoop ice cream onto bananas and spoon melted sauces atop. (I suggest vanilla paired with caramel and chocolate with fudge sauce, but by all means, go wild and switch things up!) Sprinkle pistachios, add some sliced strawberries (or, adults-only Woodford Reserve Bourbon Cherries), sprinkle very lightly with salt. Dig in! Wondering what to do with the rest of your fudge sauce? Set out a plate of ripe strawberries and a bowl of warm fudge sauce, along with some crushed nuts, and let your guests dip and sprinkle away. Set out a platter of The Savory Pantry's Hog Tails with Beekman 1802's Blaak Onion Balsamic Jam and see how quickly they disappear! The Hogs may be unpredictable this season, but we're here to help ensure that your tailgate and home football party have you living high on the hog regardless of the numbers on the scoreboard! Our original recipe "Hog Tails" punt with spice, while grid-iron baba ganouj with crunchy veggies and no fumble baked beans provide the perfect compliments to whatever protiens are coming off your grill. Don't forget to serve it all up with our Fiery Rasperback Cocktail, featuring Liber & Co's Fiery Ginger Syrup. THE SAVORY PANTRY'S "HOG TAILS"
Our garden is full of end of season jalapenos which have turned red, so I used them for this recipe. If you don't have a home garden or aren't able to locate any red jalapenos, you can substitute green jalapenos. Cut in half and core the number of jalepenos you'd like to serve, and top with about a teaspoonful of cream cheese. Wrap with 1/2 to 1 full piece of bacon, as desired, and secure with a toothpick. Grill until bacon is crispy (as pictured), roughly 10 minutes depending on temperature. Remove and top with Beekman 1802's Blaak Onion Jam with Balsamic. Serve after brief cooling period. Touchdown! Notes from Erin: The green version of this without the Beekman Blaak Onion Jam are popularly known (in Central Arkansas, anyway) as "armadillo toes." This version offers an unstoppable blitz of deliciousness by adding sweet and tangy balsamic and flavorful onion to sumptuous bacon, velvety cream cheese, and spicy jalapenos for a robust treat that will have all hogs fans calling for more. See how the plate is empty in the table picture? Expect it to happen fast, and plan to make twice as many as you think your crew will eat. I suggest 3-4 per person, depending what else you're serving. Pre-heat oven to 425 OR heat grill to medium-high. Wash and half eggplants. (If you can't find Japanese or longer eggplants, you can use those more commonly found but you might have to create thinner slices.) Cut garlic head in half. Place eggplant and garlic on roasting pan. Drizzle all with Agrumato Lemon and sprinkle with salt, pepper, and smoked paprika. Roast in oven for about 15 minutes or until soft, or grill for 10-15 minutes until soft. Allow to cool slightly. Holding the stem with one hand, use tablespoon to rake meat of eggplant into blender or food processor. To eggplant, add 1 tablespoon of tahini, a pinch more salt, a few rounds of ground pepper, a handful of chopped cilantro, and a healthy drizzle of Agrumato Lemon (maybe three tablespoons). Blend or process to desired consistency. Taste and add salt, pepper, and tahini until optimal taste is achieved. Place in serving dish, and top with smoked paprika and fresh cilantro. 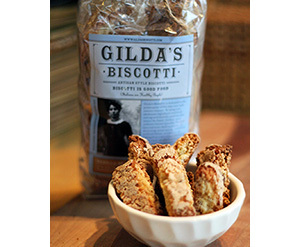 Serve with crunchy veggies of your choice or grilled/toasted pita bread. Notes from Erin: Can you make this recipe without Agrumato Lemon, JQ Dickinson Heirloom Salt, and India Tree Rainbow Peppercorns? Absolutely. Will it be as good? Nope. I use these three ingredients nearly daily in my kitchen. There is something magical about the combination. You'll be shocked how little of this salt you need compared to standard table salt, and you'll be amazed at the way it brings out all the other flavors of your food. There's a reason they use only JQ Dickinson at The French Laundry and Husk. No other salt compares. Salt aside, the Agrumato Lemon speaks of summer no matter what time of year and these peppercorns have more punch per corn than any other I've tasted. Quality ingredients really do make a huge difference. No fumble baked beans make it easy to please. Pre-heat oven to 375. Simply combine your favorite canned baked beans, a tablespoon of Tin Wholegrain Mustard, and a substantial all-over drizzle of Bees Knees Salted Honey. Stir. Add two pieces of bacon and submerge in beans with spoon. Bake for 30-45 minutes (or until most of liquid has bubbled out and edges appear sticky. No flag on this play! In preparation for our "Meet the Beekman Boys on Broadway" event Sunday, April 24 at 1pm at our Saratoga, New York store on historic Broadway, we're going all out for Beekman. Between now and this can't-miss food sampling, book signing, meeting and greeting event, we'll be whipping up and sharing with you our favorite recipes using Beekman 1802 products. Arkansas strawberries are ripening early this year, and are already showing up at local markets and farmers markets. This fresh recipe combines the sweetness of spring's ripe strawberries with smooth, sour creme fraiche and a tart balsamic drizzle from Beekman 1802. This is a very easy brunch side treat or a dessert you can make in a snap while your guests enjoy conversation around the table and await your quick return. Rinse strawberries well just prior to serving. Cut tops. Arrange in desired serving bowls. Top with healthy tablespoon-sized dollops of creme fraiche. Use tablespoon to distribute desired amounts of Beekman 1802 Drizzle over creme fraiche and strawberries. Serve immediately. Enjoy! A thank you to my sweet neighbor Susan Boe, who lent her azaleas, darling English birdies, and other props for this shoot. Susan uses vintage linens and pieces to sew lovely pillows like this one, made from a vintage purse. Thanks for all your help, Susan! It's my favorite time of year at The Savory Pantry . . . the new harvest of Grove 45 Extra Virgin Olive Oil is in! I love experimenting with unique ways to use this exceptional oil. Keeley personally knows the growers, Nena Talcott and Bonnie Storm, who plant, grow, harvest, bottle and even hand-label each bottle of Grove 45 in California. A couple of years ago we developed our Extra Virgin Chocolate Sorbet, which I have made for family and friends to much acclaim! This year's recipe was inspired by grilled Halloumi cheese I often order at Zorba's, my favorite Greek restaurant here in Baton Rouge. Halloumi is a sheep's milk cheese traditionally from the Greek island of Cyprus, and has a high melting point that makes it uniquely grillable. The cheese itself is wonderful of course, but the pool of olive oil that it is served with is the real star. Halloumi isn't easy to find in stores, so I decided to substitute it with goat cheese that I did not grill. Slice goat cheese into 1/4" thick rounds. I warmed my knife under hot water and dried it with a towel before slicing. Start with an empty mason jar or air-tight container of your choice. I put a couple of bay leaves and a spring of rosemary in the bottom, and topped with a thin layer of olive oil and cracked pepper. Next, add a round of goat cheese, more herbs, more pepper, and drizzle with oil. Continue layering and top off with an extra "glug" of oil. Allow to marinate at room temperature for an hour or so, then refrigerate overnight. Remove from the fridge and pour everything onto a plate for an instant presentation. Serve chilled or allow to come to room temperature. Enjoy with crackers, warm crusty bread or pita. Some similar recipes online mention issues with the olive oil solidifying in the refrigerator, due to some olive oils being diluted with lesser quality oils. I am happy to report that the Grove 45 oil did not solidify and was just as viscous after refrigerating! After marinating, the cheese has a more spreadable texture and is less crumbly than a typical goat cheese. Vary this recipe with your favorite fresh herbs. I used what I had in my garden and pantry! Chop chocolate very finely and place in large mixing bowl. Bring cream to a boil. As soon as it is boiling, remove from heat. Wait 20 seconds and pour through a mesh, over the chopped chocolate. With a whisk, blend the chocolate and cream until smooth. Whisk in coffee and bitters. Allow the mixture to come to room temperature for 1 hour. Scoop teaspoon-sized portions onto a baking tray lined with a Silpat or parchment. Refrigerate the scooped portions for 30 minutes to an hour. Roll each ball in confectioners sugar, cocoa powder, or finely chopped nuts. Store truffles in the fridge for up to 2 weeks. Serve at room temperature. Makes 40-60 truffles, depending on size. This is a messy process and you will get chocolate all over your hands! Which also makes it fun. You might try working with disposable plastic gloves. Good to roll up a couple of truffles at a time and coat them in coating of your choice while they are still sticky from the warmth of your hands. Research reveals that anything above 60% cocoa is considered semi-sweet and anything above 70% cocoa content is considered bittersweet. This is helpful when selecting The Savory Pantry’s specialty chocolate bars that meet these criteria. Choose all bittersweet or all semi-sweet, depending on taste preference. A melon baller would work well for scooping the initial portions of chocolate that will later become truffles… the closer you can get them to round in the portioning, the easier your job will be when it comes time to roll them in your hands. A Note from Amy: I live in Baton Rouge, Louisiana, where humidity must be taken into consideration when making truffles and other recipes that require setting or cooling, as humidity prolongs the setting-up process. The light went off inspiring this recipe after trying the Prestat Truffles Keeley carries at The Savory Pantry, and wanting to try my hand at them. I’d heard bitters could be substituted when vanilla extract was called for. I received some bitters as part of a cocktail gift from Keeley when my husband and I were married last May and I was excited to branch out from using them in Old Fashioneds. I provide graphic design for The Savory Pantry, and maintain it’s Facebook and Pinterest pages.